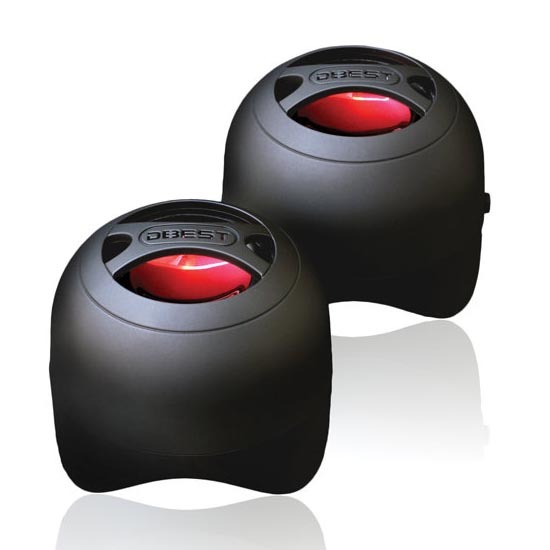 We have introduced a few nice portable speakers with Bluetooth technology. But if you want to freely place every speaker unit, the following DBEST PS4003BT portable wireless speaker system may be more suitable for you. DBEST PS4003BT is an ultra portable stereo speaker system that consists of two speaker units, each one measures 2.4 x 3.9 inches. As we can see from the images, each portable speaker features portable, sleek design, and the stereo speaker system come with powerful built-in dual amplifiers in order to produce exceptional sound clarity and depth for your favorite music, while the built-in Bluetooth technology allows you to connect the speaker system with any Bluetooth-enabled music player, and integrated 3.5mm audio input also allows to connect it with any music player with 3.5mm audio jack. Apart from that, the built-in rechargeable battery offers you up to 20 hours wireless or 40 hours wired playback. DBEST PS4003BT wireless speaker system is priced at $69.99 USD. If you’re interested, jump to Brookstone for more details. Additionally, if you need other options, you might like to check iSound Twist wireless speaker and more via “wireless speaker” tag.